The past few months have been extra busy so Lisa and I haven’t done one of our usual monthly grocery hauls/hippie days since March. We finally found time to go shopping yesterday and as usual, we had a great time. We noticed that Norman now has an Aldi’s grocery store and since we will soon have one in Ada we decided to do a quick walk-through just to see what it’s like. While it won’t take the place of all our out of town grocery shopping, it will be a nice addition to our town. We dropped off glass recycling then headed to our favorite lunch spot, Tres Cantina. We both opted for the Chicken Barbacoa sandwich on freshly made croissants. So yummy! We also talked to the owner about scheduling one of our HMA bands to play there and gave her a CD of a few of Rowdy Folk’s songs. Before we started our grocery shopping we decided to check out an antique store across the street from Tres Cantina. So many cool things, including a whole room full of vintage guitars. I also found David’s Father’s Day gift there. Then it was time to get busy. We hit up a total of five food stores plus Cellar’s, a HUGE liquor store with an amazing selection. I was down to one bottle of Pinot Noir at home so I bought two bottles, including one I haven’t tried before. I also bought a bottle of the Scotch I recently tasted at a wedding. I don’t normally like Scotch (I prefer whiskey) but this one was exceptionally good. I also picked up a bottle of Prairie beer (artisan beer made in Oklahoma) which I thought Chris might like. David received a couple of bottles of rum as birthday gifts which he hasn’t opened yet so we are now all set in the alcohol department for quite awhile. Midway through our shopping we picked up cherry limeades at Sonic. We decided we deserved a treat and they really hit the spot. I had intended to go straight home after dropping off Lisa but I ended up meeting David for dinner at Rib Crib where Brittany Nicole, one of our musicians, was performing. I was just going to eat and go home but several friends joined us so I stayed until the music ended at 9 p.m.
I’ll do some reorganizing tonight or tomorrow but at least I managed to get in all in there. It was touch and go there for a bit but I finally did it. My freezer and pantry are every bit as crammed. As busy as our life has gotten I’m not sure when I’ll make my next shopping trip but I can pick up dairy at Braum’s and produce at the farmers market. I’m well-stocked on everything else so I can make do here in town for quite awhile. 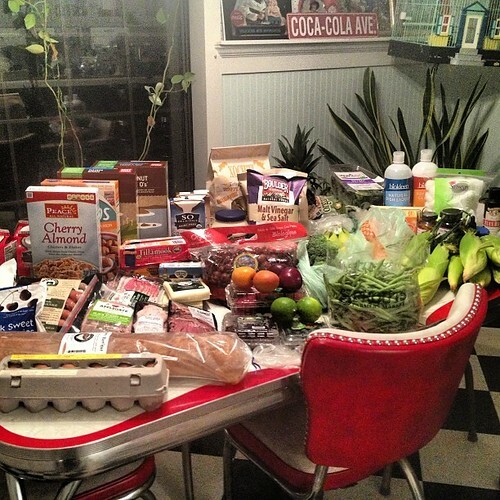 In fact, I’m so well-stocked that I didn’t need to order from Azure Standard or Oklahoma Food Coop this month. We are eating mostly vegetarian this summer so as long as I can make it to the farmers market we’ll be fine. One of the things Lisa and I like about shopping at what we refer to as “hippie stores” is that the workers are always so nice and often a little quirky. At Natural Grocers we overheard the cashier in the line next to ours ask his customer, “Are you living the dream?”. That’s not the sort of question one is likely to get at Walmart. I just love the cool, peaceful, hippie vibe these stores have. Even though it’s a long day for us it’s not in any way stressful. I would much rather devote a whole day once a month shopping with my daughter like this than weekly trips to Walmart. I used to feel like I needed a shower, massage and stiff drink after shopping at Walmart. It’s now been about six years since I’ve been in Walmart and I haven’t missed it one iota. What about you? 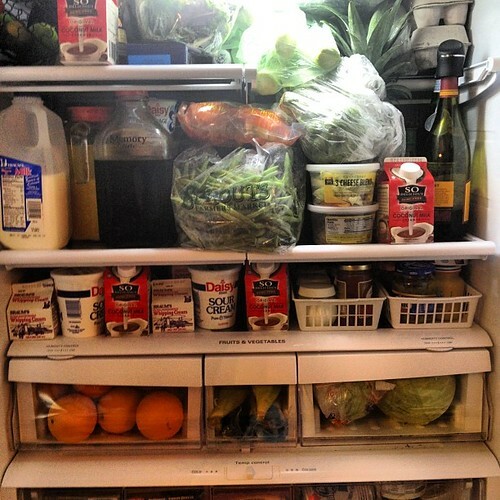 How do handle your grocery shopping? What are your favorite stores?